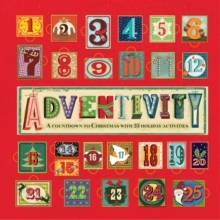 Adventivity is an Advent calendar and activity book rolled into one! This title includes all the creative material you need for Christmas in one book. The front cover doubles up as an advent calendar, there are easy-to-follow instructions and all the creative card components you need for 25 fabulously creative holiday activities. What more would you want for some festive fun? The sturdy card calendar can be reused year after year. Each door reveals a surprise - including four pop-ups - related to the mini-project the book sets out for that day.